Say goodbye to phone calls or emails to check preferred rates, or even worse, after-the-fact policy management. 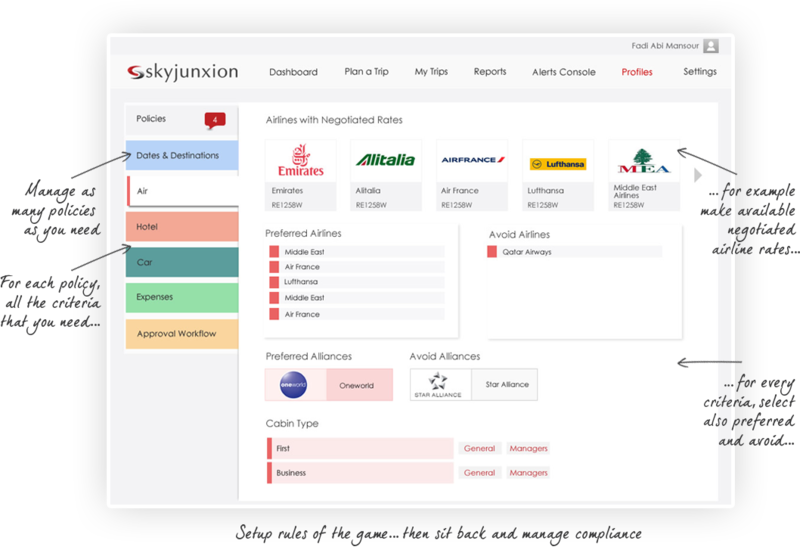 With Skyjunxion you can setup and manage multiple policies to accommodate for different groups of people. If you need hard cost reduction measures, you can choose to mandate lowest air fares and black out dates or destinations. You can also avoid having many key people on the same flight with security rules. Setup preferred & avoid vendor rules for every airline, hotel & car rental. You can also load negotiated fares and rates with airlines, car rental & hotel chains, and make them available to the organization immediately. Setup expense rules either by ceiling per diem or ceiling per expense type. Your travelers will be reminded of the policy upon filing their expenses, not after the fact. Expense rules can also be set up by country/city (eg. Dubai is more expensive than Amman, so a different expense policy should apply).